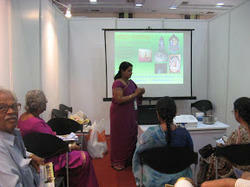 Engaged in providing services such as cooking classes. 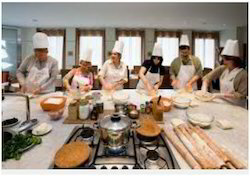 These classes are for one and all amateur cooks who wish to hone their skills & become perfect in the culinary art , thus attain confidence in trying out innovative recipes which can be done under Komal's Kitchen Affairs Culinary Workshop; where the students are personally trained on one-to-one basis to give first hand at Cooking. Khao Suey, Thai Red Curry, Thai Green Curry, Mussaman Curry, Tofu Salad, Carrot & Pumpkin Curry, Fragrant Coconut Rice, Pad Thai, Tom Yum Soup, Satay. - Less students in each batch to ensure individual attention and customization of diet. Learn a variety of cakes, including: Cakes and Cupcakes with Eggs, Cakes and Cupcakes without Eggs, Designer Cakes with Icing, Designer Cupcakes with Icing and many more. invites her foreign guests to taste and enjoy the delicacies and world famous flavors of Indian cuisine while learning a few recipes and tips during their visit to India. Cook like the world’s watching − Take a MasterChef Class, taught by ACS Chefs From seasonal favorites to creative courses in cooking, baking, cake decorating and more, MasterChef Cooking Classes, taught by Le Cordon Bleu Chefs, have something to teach enthusiasts of all levels.